The latest ONS report on the economy highlights the UK's ongoing problem with productivity. Typically 17% below the G7 average so why is this? The answer lies in the balance of the economy or the mismatch between manufacturing and services. To understand we need to look beyond the purely monetary values of products and services and to the wealth that is represented. Or more specifically the wealth creation parts of the economy, as epitomised by manufacturing and wealth destruction which is usually relates to services. It is quite easy to quantify productivity and improvement in the wealth creation process. In manufacturing it may be a new process; for oil, gas or water pipelines, larger pumps; or improved seeds or fertiliser that raise the yield in agriculture. But productivity in wealth destruction is a little more nebulous. 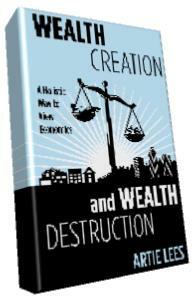 As with wealth creation it is generally equates with doing more for less, which usually means saving time. But as the quality of a service is usually defined by the attention to detail which by its nature takes time. This is illustrated by a barber. The time taken for a haircut may not be much different from today as it was 100 years ago. The invention of clippers could speed up the process but it is unlikely to happen if the barber wants to retain his customers. In fact the richer we get the more willing we are to pay more for services with the subsequent knock on to productivity. This is demonstrated by the move by many caterers to serve coffee made from elaborate cappuccino machines where once instant coffee would have sufficed. This not to say that fresh filter coffee is far superior to instant but that is to mix up the quality with productivity. Services cover a wide range of undertakings from education and health to shops and leisure and whilst some can benefit from efficiencies these will be limited for those where face to face involvement is required. This figures would support this argument where in the UK services represent 78.9% of the economy and industry 20.5% . But in Germany whose productivity is some 25% greater than the UK the ratios are 69% and 30.1% respectively. However there are other reasons; banks reluctance to lend to business has meant that many of the new start-ups that one would expect to boost productivity are undercapitalised and trading on a low but common skill base. Ever rising house prices do not help removing the incentive to invest in anything but property. The ever increasing property prices also effected productivity in another way; the rise of a new breed of property developer common to day time television who buy a house to do up and then sell it on. This trend may impact on productivity in several ways. Invariably the participants will see themselves as project managers bring few relevant skills. In a professional set up this layer of management would be spread over several properties at one time whereas these small time operators will usually only be working on a single property. In addition they will be learning on the job all of which will substantially increase the time involved to undertake the work. Added to this they may have given up a day job that they were competent at which in turn requires the training up of a replacement.